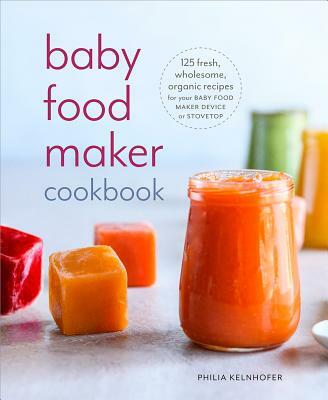 From the blogger behind sweetphi.com, this is the first cookbook for the popular baby food maker device, with 125 delicious, wholesome, nourishing recipes that will take baby from first purees to solids and beyond. Every recipe works for each of the popular models of the device and is adaptable for the stovetop plus a food processor, as well! Blogger and new mom Philia Kelnhofer is an expert at cooking up simple and nutritious meals for on-the-go families. But when it came time for her to introduce first foods to her baby, she was surprised by the challenges presented by seemingly simple purees. After making a mass batch of sweet potatoes that mostly went to waste, she tried out the baby food maker device, which steams and blends in one canister to make small, baby-sized quantities of food. She discovered she could create yummy, nourishing purees in just ten minutes—from Apple Cinnamon to Lemony Zucchini, and everything in between! From single-ingredient purees to delicious treats like Apple Pear Cinnamon Sauce Yogurt Parfaits, Chickpea-Sweet Potato Spread, and Berry, Avocado, and Coconut Milk Smoothie, these recipes show how to make the most of your baby food maker—and are just what you need to support your baby’s development. Philia Kelnhofer, a new mom and food blogger, is all about making mealtime a little easier for other busy people through simple and delicious recipes. She lives in Milwuakee, Wisconsin with her family, where she works full-time at natural products company True Botanica. Now that she's a mom, she's also dedicated her time to cooking up quick and healthy recipes for her newest and littlest member of her family.